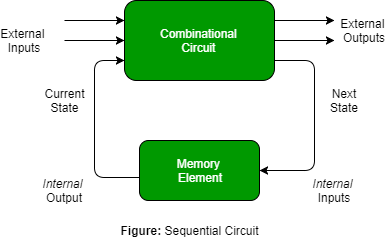 Combinational circuits are defined as the time independent circuits which do not depends upon previous inputs to generate any output are termed as combinational circuits. Sequential circuits are those which are dependent on clock cycles and depends on present as well as past inputs to generate any output. In this output depends only upon present input. There is no feedback between input and output. Used for arithmetic as well as boolean operations. Combinational circuits don’t have capability to store any state. As combinational circuits don’t have clock, they don’t require triggering. These circuits do not have any memory element. In this output depends upon present as well as past input. It is designed tough as compared to combinational circuits. There exists a feedback path between input and output. Mainly used for storing data. Sequential circuits have capability to store any state or to retain earlier state. As sequential circuits are clock dependent they need triggering. These circuits have memory element. It is not easy to use and handle.